The iPhone 6 and 6 Plus, launched in September 2014, come with an additional sensor, a barometer. It measures the pressure exerted by the atmosphere above it. This measurement of pressure can be used to forecast short term changes of the weather. With other data and some not so easy math the measured pressure also can be used to estimate the current altitude. A barometer is a passive sensor in contrast to an active sensor, like a GPS receiver. An app could alert you to your altitude when you approach certain thresholds, without draining the battery significantly. Apps could make use of an altitude trigger option, which could turn on the GPS to record your location at 50-foot increments of elevation change, saving your battery, but still recording a relatively accurate track. With a barometer the operating system can read its data, your smartphone could have noticed a drop in barometric pressure and alerted you to the change. It could also have triggered a request to update weather forecast data, saving energy and data usage by only updating when the pressure changes. 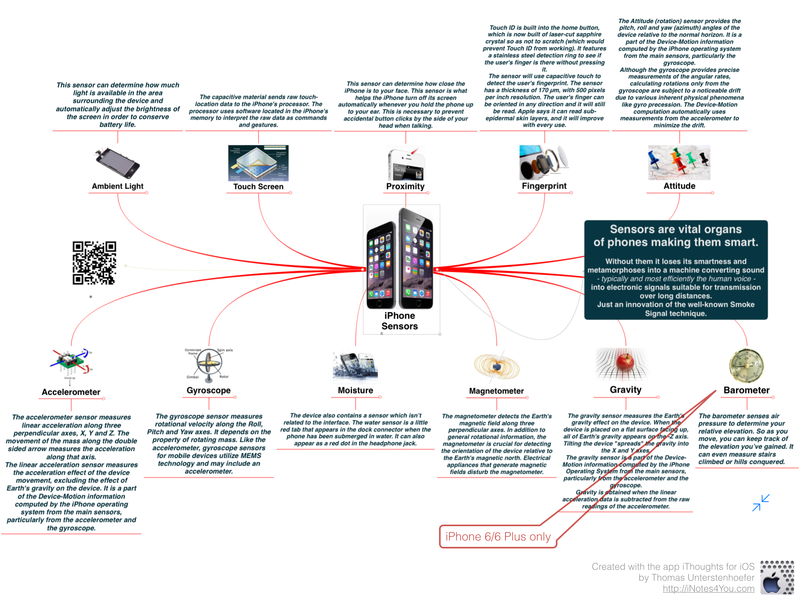 See this mind map visualizing all sensors which are built-in the iPhone models launched in late 2014. Please read my article Sensitiveness (link below) to learn more about sensors of modern smartphones. Again Apple proofed that each iteration of the iPhone adds value although some publishing media don’t stop criticizing the company for it’s loss of innovative power.